Some of the WCCLS libraries are blogging! Follow their posts to get everything from book picks, to news about teen events, to useful websites for research. Here they are in alphabetical order by library. "Good things for kids to check-out, fun things for kids to do." "Staff suggestions for reading, viewing and listening." "Beaverton City Library reference staff suggestions and tips for research, resources, search strategies and other helpful tips for finding the information you need." "Teaching 6th-12th grade students in (or near) Beaverton, Oregon? Discover events, resources, facilities, and more available to you and your students through the Beaverton City Library!" "The Adult Services staff at CMCL offers advice, reviews, and suggestions on what to read, see, or listen to next." "A Cedar Mill Community Library book blog for teens"
"What's fresh for families @ Tigard Public Library"
"You Are Here for Tigard Public Library's news, fun events, great books and more!" We can't ignore our own blog! Did you know you can subscribe to this blog and get it in your email inbox? Just click on the link above. Tigard Library patrons have a lot to say. 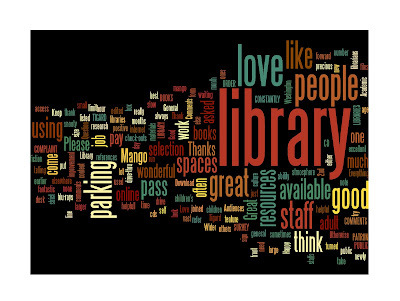 The Library received more than 3,000 responses in its annual survey. Of that, 1,462 people provided specific comments. 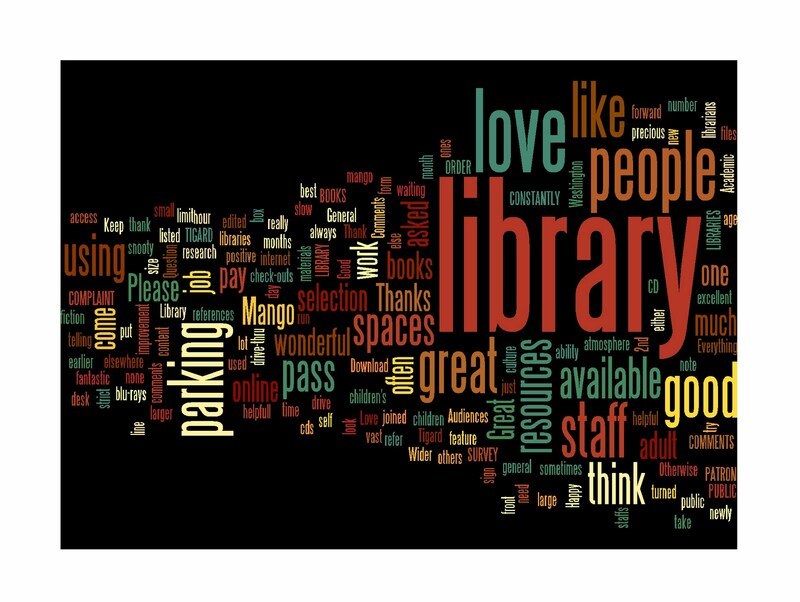 The words "great library," "staff," "books" and "love," appeared most often. Other frequently used phrases were "good job," "great job" and "great place." You can read all of the comments online and also view a summary of the results. We appreciate all the feedback! Thank you for your patience while we worked to restore access to WorldCat outside of WCCLS libraries. It is now working again and ready for your searches and requests. If you do encounter any further problems, please let us know. The Library will be closed today, Wednesday, June 8, 2011. Regular hours resume Thursday, June 9.